Many Muslims throughout the world will commemorate the milad or mawlid (birthday) of Prophet MohammedSAW on the 12th of Rabi al-Awwal, the third month of the Islamic calendar, (which corresponds to 30th November 2017 this year). At the age of forty, the Prophet SAW was blessed with the Lord’s divine revelation and proclaimed his prophethood to the world. 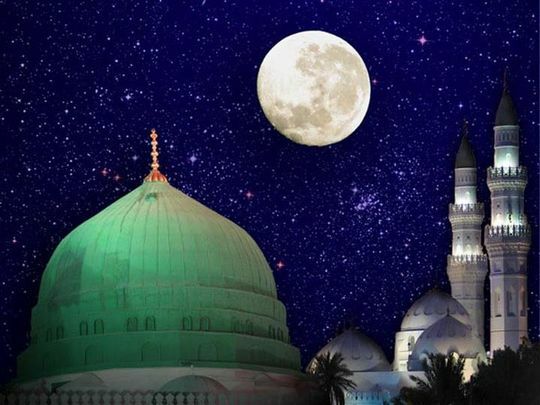 Thirteen years later, the Prophet Mohammed SAW migrated from Makkah to Madina and it was on this same date, 12th Rabi al-Awwal, a Monday, before noon, that he entered the city limits of Madina. The Fatemi Dai and historian, Syedna Idris Imad al-Din RA states that it was this day that marked the beginning of the calendar for all Muslims, literally the first ‘date’ اول التاريخ . Hence the Islamic calendar is known as the “Hijri” calendar because it begins with the Prophet’s “hijrah” (migration) to Madina. (They ask you (Mohammed) about the new moons (pl. hilaal). Say: They are the signs [of time] for the people and to (determine) the Hajj (pilgrimage) – 2:189). The calendar used by the Dawoodi Bohras is based on the lunar cycle for the calculation of months, The Islamic year dates back to the year of the hijrah and works on astronomical and mathematical calculations (tabular Islamic calendar). The lunar cycle has a fixed pattern and can be calculated years in advance. Their calculations are attributed to the teachings of Imam Jafar al-Sadiq AS. The Islamic Hijri calendar is also referred to as the “Misri” (Egyptian) calendar because it’s methodology of calculation was that followed by the Fatimi Imams of Egypt.Fatemi writers have used this calendar for dating and the Fatemi Imams promoted astronomical sciences. The epistles of Ikhwan al-Safa lay out the foundations for Islamic astronomy. The famous astronomer Ibn Yunus excelled in the field by preparing astronomical tables. His al-Zij al-Hakimi was designed under the patronage of the 16th Imam al-Hakim AS, and was thus named after the Imam. Fatemi duat such as Syedna al-Qadi al-Noman RA, Syedna al-Moiyed al-Shirazi RA, Syedna Hamiduddin al-Kirmani RA and Syedna Idris Imad al-Din RA have discussed the concepts of Islamic calendars and astronomy in their philosophical and esoteric works. The Hijri calendar followed by the Dawoodi Bohras is appreciated for its accuracy and has benefited the community in marking out auspicious dates and event planning. As we celebrate the Mawlid of Prophet Mohammed SAW, we are reminded that, regardless of a person’s belief in his prophecy or otherwise this was the birth of one of the greatest personalities of all time, a prophet who changed the course of history. That same day and date, Monday the 12th of Rabi al-Awwal, also marks the Hijrah from when is the “beginning of history” in the context of Islam. Ameer al-Jamea Syedi Yusuf Bs Najmuddin, A Philosophical discourse by His Holiness Dr. Syedna Taher Saifuddin, vol. 1, (Mumbai, Aljamea-tus-Saifiyah Press, 1421 AH/2000 AD) 6. Al-Dai- al-Ajal Syedna Taher Saifuddin RA , al- Risalah al-Ramadaniyah Tawheed al-Millat al-Bayda (Bombay: 1379H), 180. Blank, Jonah (2001). Mullahs on the Mainframe : Islam and Modernity Among the Daudi Bohras. University of Chicago Press; 1 edition (15 April 2001). Sīrat al-Malik al-Mukarram : An Edition and Study, Mohammed Shakir (Prof. Al-Jamea-tus-Saifiyah), Thesis (Ph.D.) – University of London, School of Oriental and African Studies, 1999. Dr.David McNaughton, A Universal Islamic Calendar, (Dubai,1997). Nashr Sahifah al-Salah wa al-Ibadaah (Mumbai, Al-Jamea-tus-Saifiyah 1427 H./2006 C.E.) 4/25-30. A deliberation on the irregularities In Islamic calendar, Najmuddin Saifuddin Shakir TR 2835/S, Al-Jamea-tus-Saifiyah, 2014.